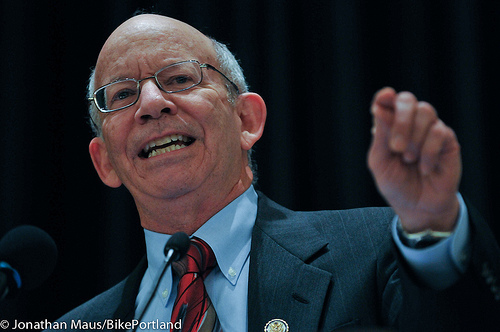 Rep. Peter DeFazio (D-OR) is already proving that he’ll put some muscle into the fight for bike and pedestrian safety in his new post as ranking member of the House Transportation and Infrastructure Committee. DeFazio and Del. Eleanor Holmes Norton (D-DC), top Democrat on the Highways and Transit Subcommittee, have signed on to fellow T&I Democrat Rick Larsen (D-WA)’s letter asking the Government Accountability Office to look into the recent rise in bike and pedestrian fatalities, which increased 6 percent between 2011 and 2012. At the state and federal level, efforts to improve the safety of walking and biking often blame the victim — as the Governors Highway Safety Association did when it flagged the recent increase in cyclist fatalities without noting that biking rates have gone up much more. DeFazio and company are emphasizing a much more fundamental problem: street design. [W]e are concerned that conventional engineering practices have encouraged engineers to design roads at 5-15 miles per hour faster than the posted speed for the street. This typically means roads are designed and built with wider, straighter lanes and have fewer objects near the edges, more turn lanes, and wider turning radii at intersections. While these practices improve driving safety, a suspected unintended consequence is that drivers travel faster when they feel safer. Greater speeds can increase the frequency and severity of crashes with pedestrians and cyclists who are moving at much slower speeds and have much less protection than a motorized vehicle affords. The GAO responds to lawmaker requests like these by investigating the matter and reporting back to help members of Congress develop a deeper understanding of the issues so they can set better policy. The GAO itself makes recommendations for improvement in the reports. They also want to know what federal initiatives and funds are needed to help states improve safety for pedestrians and cyclists. When the 114th Congress is sworn into office January 3, DeFazio will take over the top Democratic spot on the committee from West Virginia’s Nick Rahall, who never counted active transportation as a major priority. Before even assuming the post, DeFazio is showing advocates that he’ll fight harder for bike and pedestrian priorities, and that he gets it. After all, as he likes to say, he’s the only former bike mechanic in Congress. Could a Coal-n-Highways Dem Take Oberstar’s Place on Transpo Committee? Peter Defazio, the new chairman of the House Committee on Transportation and Infrastructure, talks bikes, pedestrians and transit — and getting us off fossil fuel.